Lana Davis hates Christmas, as it only brings about bad memories for her. But when an old woman gives her a snowglobe and tells her not to shake it unless she wants magic, her life takes a turn. The Nutcracker Soldier in the snowglobe comes to life. 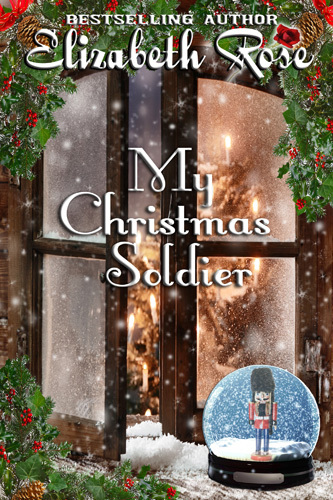 And Lana is faced with a decision of living with her past regrets or living in the now, in My Christmas Soldier. Lana Davis pushed Elmira Scanlan’s wheelchair down the hall of the Maple-Oaks nursing home, already having regrets for volunteering to work during the home’s Christmas party. Christmas was a horrible holiday for Lana, and she usually just disappeared somewhere, locking herself indoors with a good book and taking the phone off the hook until it was over. She hated Christmas. She hated anything or anyone that reminded her of the loss of her husband five years ago on that cursed day. Elmira chanted a cheery tune and clapped her wrinkled hands as they entered her room, making Lana smile inwardly. Of all the occupants in Maple-Oaks nursing home, Elmira was Lana’s favorite. The rest of her co-workers thought the old lady was a bit over the edge, but Lana liked her. Elmira listened to her troubles and comforted her. She’d always been there when Lana needed a shoulder to cry on. “Here we are,” said Lana, flicking on the lights and wheeling Elmira to the center of the room. She glanced at her wristwatch. Two hours overtime. All because of the blasted holiday and the ridiculous merriment going on downstairs. She never should have stayed for the party. But since it meant so much to Elmira, she had. The woman was able to take care of herself now that she was in her room, so there was no need for Lana to stay. “See you next week.” She turned to go, but Elmira’s crackly old voice stopped her. Lana sighed deeply and turned back toward the woman. “Elmira, we’ve been through this all before. You know I spend Christmas alone. I rather like it that way.” She pushed the woman closer to the bed and pulled back the covers. Elmira was capable of doing all this herself, but liked Lana to do it for her. Loneliness painted the old woman’s face, and though she smiled, there was a silent sadness about her. Lana’s heart ached for her. Another few minutes surrounded by this merriment might be hard on Lana, but would mean the world to Elmira. If only the old woman knew just how lonely Lana had been since Mark’s death. “Then consider it a loan.” Elmira pulled open the bureau drawer. In it sat dozens of snowglobes of every shape and size. She pulled them out one by one and laid them atop the dresser. “These are all very nice, but I really couldn’t.” Lana picked one up and was about to shake it when Elmira’s old wrinkled hand shot out and grabbed her by the wrist. “Don’t do that,” she said, and Lana got the distinct feeling she’d trespassed. “You will,” she said with a sly smile, making Lana feel a bit uneasy.